That’s a theatre term. Actually I think it’s a musical theatre term. The orchestra keeps playing until the performer is read to begin. You’ve probably all seen that on a live broadcast like the Oscars or the Emmys when the performer is not quite ready to being the song. Didn’t know you knew, did you? I feel that way at the moment. A lot of things are about to happen and I’m not quite sure which direction to turn at the moment. Trying to get ready for our trip is not going forward as I would like because of other things that have taken precedence. Nothing awful…just stuff…isn’t there always Stuff. My car’s in the shop to get the air conditioning fixed. Why do that in August? Part of the stuff. It needs it and it will be ready for next year because I don’t expect to be replacing the car any time soon. Should be finished today so I can run some necessary errands. My dryer broke. Ok…get it fixed. Well, I’m up in the air about that. It is on my PSE&G contract, but to have the man come in would require a great deal of moving around in the basement which I don’t have time to do right now and I’m pretty sure the answer will be “It’s dead.” For the time being, my friend is graciously allowing me to use her dryer, but I need my car to get there, so hopefully, this afternoon I can accomplish that. Don’t want to have to do 20 loads of laundry the weekend before we leave for our trip. I’ve been hearing about this book and wanting to read it. Of course, I was not about to pay full price for it. I was about to request it from the library when…there it was. $1.49!! I’m not happy that Goodwill raised their book prices but I’ll take it. There actually was an audible gasp when I saw this on the shelf. Luckily, there was no one around me at the time. I got two others also, but I can’t remember what. They’re in my car…in the shop…blah, blah, blah… I think I’ll save this to read on the trip. I am longing for Fall as I do every year at this time. Actually, I long for Fall year round, but obviously there’s nothing I can do about it. This time of year, I know it’s coming and I’m basically anxious for it to get here. Being away will not bother me. The Fall will find me in New Mexico. Boy, will you all be sick of me when I’m actually spending Fall in New Mexico for real! 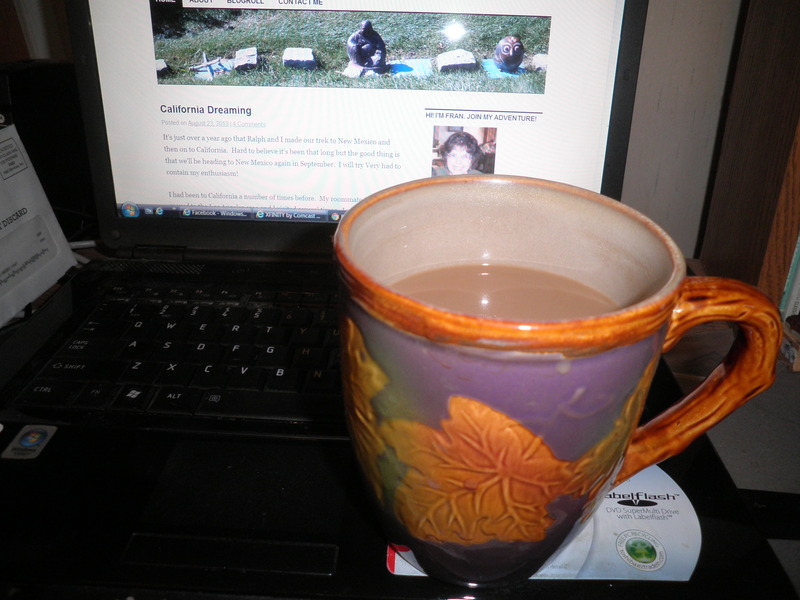 I’ve broken out my big Fall mug and yes the coffee inside is pumpkin-spiced! Couldn’t help it. Just had to do it. I’m going over a lot of things in my head regarding the trip. Mental lists at the moment, but I really need to get to work on the tangible lists. Lots to do and although I want the trip to get here, the getting here is going to be sooner than I expect, so I’d better get myself in gear to be ready. I’m still working on sorting and donating. I’m trying to sell some things too, but that’s not working as well as I’d like. I’ve sent out some e-mails to antique shops but haven’t heard back. I may just decide to shelve that until we get back. I’d better get myself going…Lots to do and not enough time to do it. i love the title and how it fits in real life. obviously not an awesome feeling, but it fits so perfectly from the theater! You’re too cute! Vamp till ready has always been one of my favorite phrases. I think we can still squeeze a bit of summer out while starting to “feel” Fall. We get to do that tomorrow at Rock A Hula!!! Can’t wait! Oh, no, Val…I do Not want anymore heat. I’ve had it. That’s one of the reasons I enjoyed Maine so much. And of course…one of the reasons I can’t wait to get to NM…Bring on the Fall!! I love it, Laura!! Have fun…will there be Instagram Vamping?!? LOL! I should have IG’d more. I need to catch up! Fall is just my favorite, Liz!! I’ll bet it’s beautiful in your area. Have a great weekend! 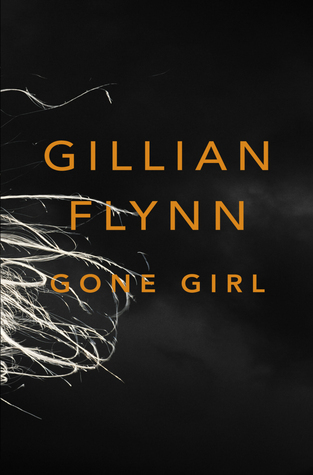 I had very mixed feelings about Gone Girl…so interested in your thoughts Fran! Ok, Ameena. It’s one of those books you “hear about” everywhere! I usually drag my feet on that type. But it was there and only $1.49…I figured it was worth a try. I’ll be reading it while we’re in NM so I’ll let you know!